March | 2015 | Mediascope, Inc. This article continues our series of looking at services provided by full-service fulfillment companies. Today’s topic is Order Management. If you are selling a product over the internet, you want it to be easy for your customer to place an order. You also want your customer to feel valued and informed about the status of their order. When done right, your customer’s great buying experience will keep them coming back for more. Your customer’s buying experience will be largely dependent on the software used by your fulfillment provider. It’s important to know that not all softwares used by fulfillment companies have the same capabilities. Options vary greatly and depending on which software your provider uses, they may not be able to provide all the services you’d like to see. Put yourself in your customer’s shoes for a minute. Is it easy for them to place an order? Do they receive an email thanking them for the order? Can your customer submit an order by phone? By email? By fax? What about timelines? What happens when your customer places an order through your website? Is the order automatically uploaded and processed, or is it held until there is sufficient volume to warrant processing orders? Is there a regular schedule as to when orders are processed? Do your customers receive an email letting them know if an item is on back order? If an item is on back order, does your provider immediately send the available portion of the order or do they wait to ship until all of the items are available? How about shipping—do your customers get an email with a tracking number? If your customers are local to the fulfillment provider, can they pick up the order from the fulfillment company? As you can see, there are many options for handling orders, and options vary by fulfillment provider. Be sure to discuss your thoughts with your fulfillment provider so that you understand the available options and your provider understands the services you’d like implemented. Why Work with Your Full-Service Fulfillment Provider on Web Site Creation? Last week, in Fulfillment Service . . . so much more than filling orders!, we talked about the value of a full-service fulfillment provider. If you remember, we likened a fulfillment provider who does nothing but fill orders to a turkey dinner with a menu of only turkey. The experience just isn’t the same. Today, let’s look at one component a full-service fulfillment provider offers: Web Site/Shopping Cart Creation. The online shopping industry has grown considerably over the past decade. According to Statista, in 2012, U.S. e-commerce sales amounted to 289 billion U.S. dollars, up from 256 billion U.S. dollars in 2011. Retail shopping websites generated the largest share of online revenue at 210.3 billion U.S. dollars in 2013. A current e-commerce market forecast projects online retail revenue in the United States closing in on 500 billion U.S. dollars in 2018. Simultaneously, the number of U.S. digital buyers is expected to grow from over 157 million in 2013 to 180 million in 2017, according to industry estimates. Online orders are obtained through web sites and shopping carts. Shopping carts are the portion of the website designed to take the order, figure the shipping costs, capture a delivery address, and so on. This information is electronically provided to the fulfillment services center in order to fill and ship out an order. 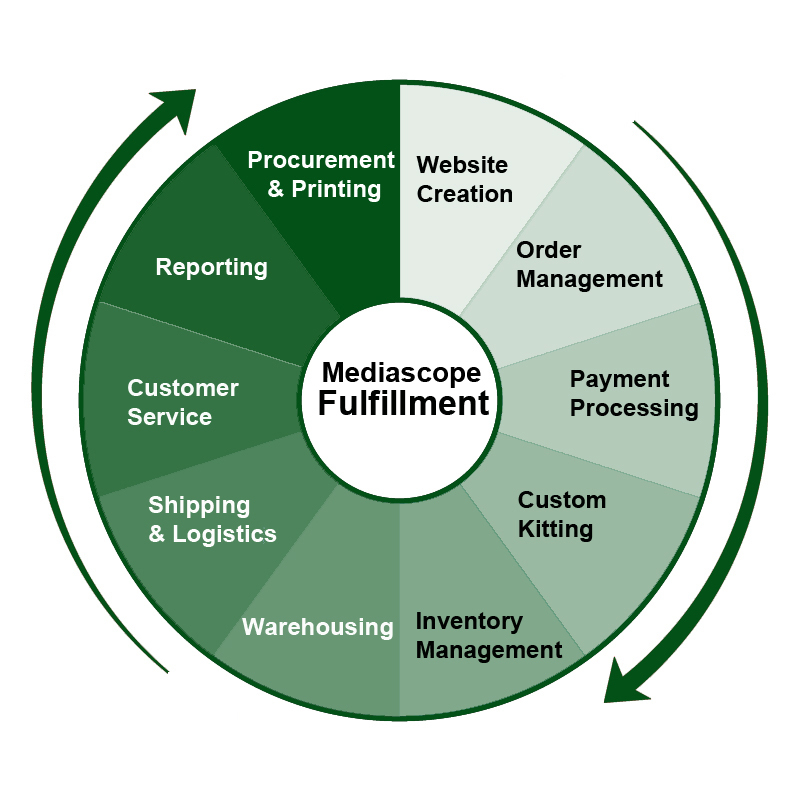 Fulfillment companies work with a variety of software packages for processing orders. Not all fulfillment softwares work with all web site platforms. By using your fulfillment service provider to create your web site/shopping cart, you ensure compatibility between softwares. That means an easier start-up and more efficient order handling. At the very least, if you have the web site/shopping cart created somewhere else, be sure your designer is in constant communication with your fulfillment provider to ensure compatibility and seamless transitions. One final note: according to Marketing Land, 30% of web site traffic now comes from mobile devices. Not all web sites and shopping carts are mobile-friendly. Be sure to test your web site and shopping cart on a variety of devices including both a Macintosh and PC computer, a tablet, and a smart phone. Fulfillment Services . . .so much more than filling orders! A common misconception in the business world is that fulfillment services consist of nothing more than filling orders. Let us take a look at why that isn’t true, and what a full-service fulfillment provider offers. As you can see from the chart, fulfillment, when done correctly, has many components to it. While each of them could stand alone, integrating them together provides added value for both you and your customer. Each of these pieces is important and we will talk more about them over the next few weeks. For now, however, let’s look at the overall picture. Why is it so important to have all of these components? Imagine having a Thanksgiving dinner with only turkey. No potatoes, no cranberry, no stuffing, no vegetables. No dessert, even. A Thanksgiving dinner with only turkey is like a fulfillment center that does nothing but fill orders. The core element is present, but the rest of the experience is missing. A full-service fulfillment center not only fills the order but makes sure inventory is available, pre-packages sets or kits to save you and your customers money, coordinates and negotiates shipping to get the best possible rates, answers customer inquiries, and much, much more. Using the Thanksgiving dinner analogy once again, rather than serving only turkey, a full-service fulfillment company provides a coordinated package designed to give your customers the very best possible experience. The Postal Regulatory Commission (PRC) recently approved First-Class Mail price adjustments which will take effect on April 26, 2015. In a separate order, the PRC also approved an average price increase of 5.5% for certain competitive products such as Priority Mail and Priority Mail Express. The USPS price adjustment request for all remaining Market Dominant products are still being reviewed by the PRC and are in a pending state. That means rates for other categories of mail, including standard and periodicals, have not yet been determined. The Single-Piece additional ounce for letters increases to $ .22 from $ 0.21. First-Class pre-sorted letters and postcards will go up an average of 2.4%. Specific rates have yet to be announced but will be revealed at a time closer to the date of the change. Single-Piece Postcard rate will go up to $ .35 from $ .34. The price of the first ounce for a Single-Piece Flat remains $0.98. 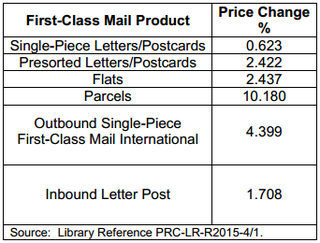 The retail First-Class Mail Parcels price for the first three ounces increases to $2.54. The DC Court of Appeals decision regarding the exigent rate increase is still pending. As it stands today, the exigent amount of 4.3% will be rolled back once the Postal Service achieves $3.2 billion in revenue associated with the exigent increase. At the current collection rate, it is estimated to occur around August of 2015.